Sa’i (Arabic: السعي) is one of the integral rites of Hajj and Umrah and refers to the ritual of walking back and forth seven times between the two small hills of Safa and Marwa, located adjacent to the Kaaba in Masjid al-Haram. Linguistically, the word is derived from the Arabic verb Sa’a (Arabic: سعى) which means “to walk”, “to strive” or “to pursue”. Its technical meaning is to walk between Safa and Marwa in a particular manner a total of seven times. The rite of Sa’i commemorates the actions of Hajar P, the wife of Ibrahim S who walked between the hills of Safa and Marwa seven times in search for water for her son Ismail S.
Tradition states that Ibrahim was living with his wife, Sarah P and her slave girl Hajar in Palestine. According to Nasir al-Din al-Rabghuzi V, the famous Turkish author of Qisas al-Anbiya (Stories of the Prophets), Hajar was the daughter of the King of Maghreb and a descendant of the Prophet Salih S. After her father was killed by the Egyptian Pharaoh, she was taken into slavery and later given to Sarah. As the years passed and as she grew older, Sarah remained childless so she suggested to her husband that she should have a child with her slave girl Hajar. Not long thereafter, as a result of their union, Hajar gave birth to a son, Ismail S who was to become the father of the Arabs and the forefather of the blessed Prophet ﷺ. In response to a divine revelation soon after Hajar had given birth, Ibrahim brought her and Ismail to Makkah (then known as Bakkah) and left them under a tree with a water skin and few provisions. After a while, the water in the water-skin ran out and Hajar, who was still nursing Ismail, could no longer produce milk. As a result of the thirst, Ismail began having seizures and was close to death before Hajar desperately started looking for water in the desert. In her desperation, she climbed the hills of Safa and Marwa to get a better view of the area and to seek out any passing desert travellers, before running between them seven times. After returning to check the state of her son, she heard a voice which turned out to be that of the angel Jibril S, who was scratching the ground with his heel (or with his wing, according to other narrations), bringing forth water. Hajar immediately started drinking from this spring and was able to feed her son thereafter, saving his life. She later dug a well around the spring, which came to be known as the well of Zamzam. Jibril S assured Hajar that she shouldn’t worry about dying and informed her that her son and his father will someday build the House of Allah at that very location. Not long after, a group of people whose water supplies had run out were travelling through the desert. In search of water, they noticed that the birds were flocking to a particular area and being aware that birds congregate at water sources, they headed in that direction. When they arrived, they sought permission from Hajar to drink from the well of Zamzam to which she obliged. This group of people, known as the tribe of Jurhum, settled in and populated this area, bringing about the establishment of Makkah al-Mukarramah. Indeed, Safa and Marwa are among the symbols of Allah. So whoever makes Hajj to the House or performs Umrah – there is no blame upon him for walking between them. And whoever volunteers good – then indeed, Allah is appreciative and Knowing. Whoever performs Sa’i between Safa and Marwa should remember his meekness, humbleness and need for Allah to guide his heart, lead his affairs to success and forgive his sins. He should also want Allah to eliminate his shortcomings and errors and to guide him to the straight path. He should ask Allah to keep him firm on this path until he meets death, and to change his situation from that of sin and errors to that of perfection and being forgiven, the same providence which was provided to Hajar. In contrast with Tawaf which focuses one’s mind on Allah, Sa’i symbolises the ongoing struggle that we encounter throughout our lives, as Hajar P had experienced. However, through her unwavering Tawakkul (reliance on God), her supplications were answered and her needs were met. For the pilgrim, Sa’i is a time for meditation and reflection on one’s presence in the physical world. The Sa’i should take place after Tawaf. For those performing Umrah, Sa’i should be observed after Tawaf al-Umrah. For those performing Hajj al-Tamattu, Sa’i should be performed twice: once after after Tawaf al-Umrah and another after Tawaf al-Ziyarah. For those performing Hajj al-Qiran or Hajj al-Ifrad, Sa’i should be carried once out after either Tawaf al-Qudum or Tawaf al-Ziyarah. If it is performed after Tawaf al-Qudum on arriving in Makkah, it will no longer be necessary to perform it after Tawaf al-Ziyarah. According to the Hanafi school of thought, those performing Hajj al-Qiran should perform Sa’i twice: once after Tawaf al-Umrah and again after either Tawaf al-Qudum or Tawaf al-Ziyarah. Unlike Tawaf, which is an independent act of worship and may be performed voluntarily without having entered into a state of Ihram before the ritual, Sa’i must be first preceded by assuming Ihram either for Hajj or Umrah. This does not necessarily mean that the pilgrim must still be in Ihram while performing Sa’i; Hajj pilgrims may perform the rite after Tawaf al-Ziyarah on Yawm al-Nahr having left the state of Ihram. The first lap must begin at Safa. If an individual starts from Marwa, the lap would be considered void. If during the course of Sa’i you have doubts regarding the amount of laps you have completed, you should take the lowest amount you think you have done. 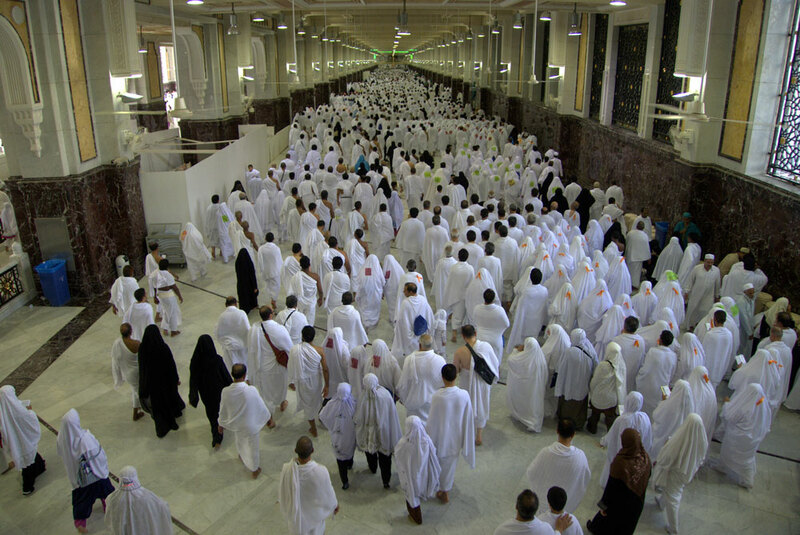 The entire distance between Safa and Marwa must be traversed, a distance of 450 metres (1,480 ft), with the seven laps amounting to approximately 3.15 km (1.96 miles). If any part of this distance is left uncovered, the Sa’i will remain incomplete. It is a Sunnah to perform Sa’i immediately after Tawaf, although you may take a break if you need to. If you feel tired after Tawaf or your feet are aching, you may take a rest in the pavilion until you feel you’re ready. Remember, you will be covering over three kilometres during Sa’i, so make sure you have sufficient energy to complete the rite before starting. While Wudhu is not a prerequisite for Sa’i, it is Sunnah to perform the ritual with Wudhu. The Sa’i will, however, be valid even if it carried out in a state of minor or major ritual impurity (requiring Ghusl). Therefore, women in a state of menstruation or post-natal bleeding can perform Sa’i. Prior to performing Sa’i, it is Sunnah to return to the Hajar al-Aswad in order to do Istilam. You will be carrying out Istilam for the ninth time, following the eight times you performed Istilam during Tawaf. This Istilam is only applicable if Sa’i is performed immediately after Tawaf. If you’ve forgotten to perform Istilam prior to Sa’i, or you’re finding it difficult to return to the line of the Hajar al-Aswad due to crowds or tiredness, it may be left out. However, it can also be performed in Masjid al-Haram, as long as you are facing the Hajar al-Aswad. Istilam is to be performed in exactly the same manner as it was performed during Tawaf. Inna ṣ-ṣafā wa l-marwata min sha’ā’iri llāh(i). Indeed, Safa and Marwa are from the Signs of Allah. I begin with that which Allah has begun with. These supplications are only to be recited once before Sa’i and not at the start of each lap. 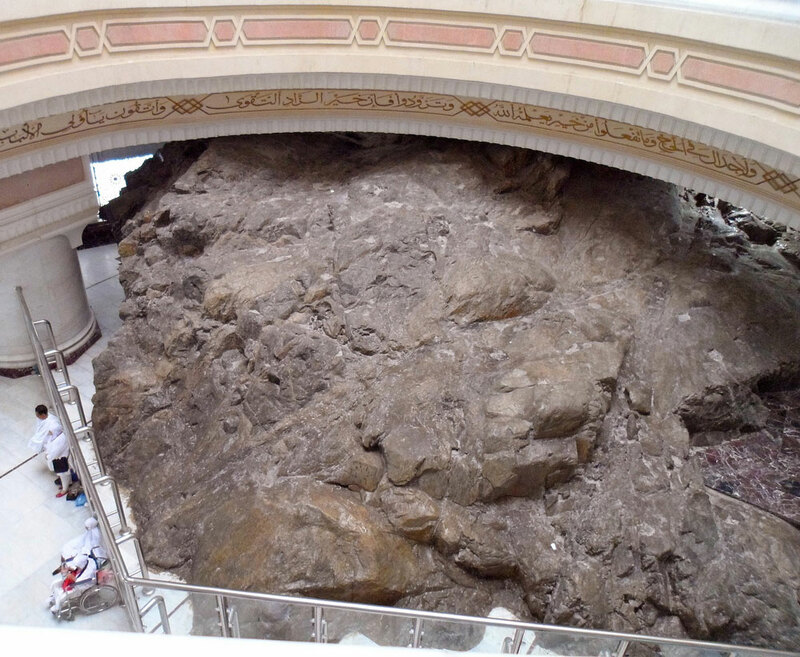 Upon reaching the hill of Safa, face the direction of the Kaaba and raise your hands in supplication. Your view of the Kaaba will be obscured so make an educated guess about its location and face this direction. Don’t raise your hands up to your earlobes or gesture towards the Kaaba as you would have done during Tawaf. Allāhu akbar, Allāhu akbar, Allāhu akbar, wa lillāhi l-ḥamd. Allah is the greatest; Allah is the greatest; Allah is the greatest, and to Allah belongs all praise. Lā ilāha illallāh waḥdahu lā sharīka lah(u), lahu l-mulku wa lahu l-ḥamdu yuḥyī wa yumīt(u), wa huwa ‘alā kulli shay’in qadīr. There is no deity except Allah, alone without a partner. To Him belongs the Dominion, and to Him belongs all praise. He gives life and death and He has power over everything. Lā ilāha illallāhu waḥdah(u), anjaza wa’dahu wa naṣara ‘abdahu wa hazama l-aḥzāba waḥdah. There is no deity except Allah alone. He fulfilled His promise, supported His slave and defeated the confederates alone. After reciting this Dua, you may recite your own supplications. Read the Dua a total of three times, making your own supplications in between each time, as was the Sunnah of the Prophet ﷺ. From Safa, make your way towards Marwa. 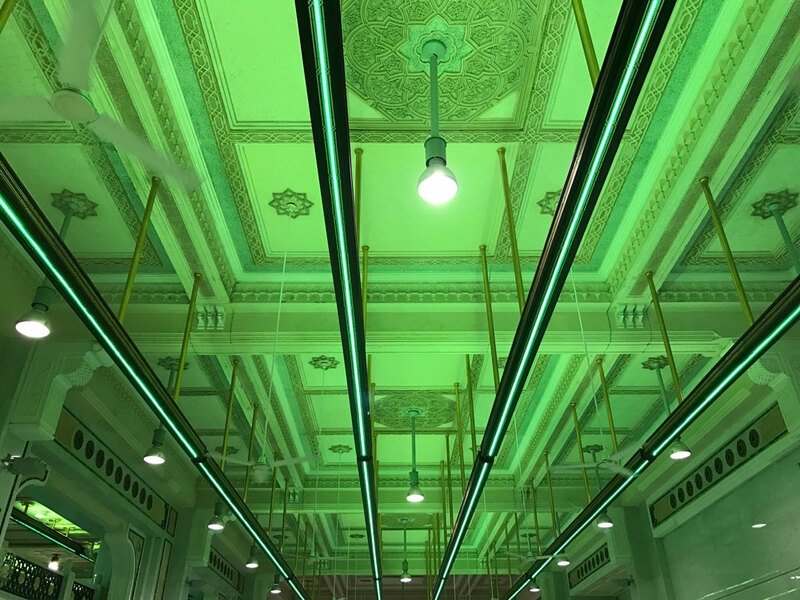 Between Safa and Marwa, you will encounter two sets of green fluorescent lights approximately 50 metres apart, which indicate the distance that Hajar ran in order to get to higher ground. These two markers are known as Milayn al-Akhdharayn (the two green mileposts). Between these two lights, it is Sunnah for men to run at a medium pace while women should continue normally. There is no fixed Dhikr or Dua that has been prescribed to be read during Sa’i, so you may recite any prayers or supplications of your choice and send Salawat upon the Prophet ﷺ. Upon reaching the hill of Marwa, face the direction of the Kaaba, raise your hands in supplication and repeat the same supplications you recited at Safa. This completes one lap of Sa’i. Returning back to Safa is considered a second lap. Repeat this procedure until you have completed seven laps, at which point you should be at the hill of Marwa. It is recommended to make a final Dua here and also to perform two Rakahs of Nafl Salah in Masjid al-Haram following Sa’i. Bismi llāhi, wa ṣ-ṣalātu wa s-salāmu ‘ala rasūli llāh. Allāhumma innī as’aluka min faḍlik. In the name of Allah, and peace and blessings be upon the Messenger of Allah. O Allah, I ask of you from Your bounty. If you’re performing Umrah outside the Hajj season or Umrah as part of Hajj al-Tamattu, you will have your hair shaved or clipped following Sa’i allowing you to leave Ihram. This marks the completion of your Umrah. If you’re performing Hajj al-Qiran on the other hand, you won’t have you hair cut and will remain in the state of Ihram until Yawm al-Nahr. Allāhumma ‘simnā bi dīnika wa tawā‘iyatika wa tawā‘iyati Rasūlika, wa jannibnā ḥudūdak. Allāhumma j’alnā nuḥibbuka wa nuḥibbu malā’ikataka wa Anbiyā’aka wa Rusulak, wa nuḥibbu ‘ibādaka ṣ-ṣāliḥin. Allāhumma ḥabbibnā ilayka wa ilā malā’ikatika wa ilā Anbiyā’ika wa Rusulik, wa ilā ‘ibādika ṣ-ṣāliḥīn. Allāhumma yassirnā li l-yusrā, wa jannibnā l-‘usrā, wa-ghfir lanā fi l-ākhirati wa l-ūlā, wa-j’alnā min a’immati l-muttaqīn. O Allah protect us by Your religion and obedience to You and obedience to Your Messenger, may Allah bless him and grant him peace, and avert us from [contravening] Your limits. O Allah, make us love You and love Your angels, and Your Messengers and Prophets, and make us love Your righteous servants. O Allah, make us beloved to You, to Your angels, to Your Messengers and Prophets, and to Your righteous servants. O Allah, make the easy easy for us to attain and ward off from us the difficult. Forgive us in the Hereafter and this world and make us leaders of the God-fearing. Rabb ighfir wa rḥam, tajāwaz ‘ammā ta’lam(u), innaka anta l-a’azzu l-akram. O my Lord, forgive, have mercy, and pardon that which You know. Truly You are the Most Mighty, the Most Noble. Rabbanā ātinā fi d-dunyā ḥasanatan wa fi l-ākhirati ḥasanatan wa qinā ‘adhāba n-nār. O our Lord, grant us the good of this world, the good of the Hereafter, and save us from the punishment of the fire. For the elderly or disabled, there is a wheelchair section. Tiredness is not an excuse to use a wheelchair. Men may abstain from running between Milayn al-Akhdharayn (the two green mileposts) if they are taking care of the elderly or female pilgrims. Continuity is not a necessary condition for Sa’i. Therefore, if you need to stop your Sa’i, for example, to answer the call of nature, you may resume from the position that you stopped. If a Fardh prayer is due to start, you must join the congregation and resume your Sa’i from where you left. If you can’t remember exactly where you stopped, start the lap again. Talking is permissible during Sa’i, although it should be necessary and not merely idle or worldly talk. Sa’i can also be performed in the middle and roof areas. If you’re performing Sa’i during a hot day, the middle would be a better option. The roof is the better option at any other point during the day. To have entered into Ihram prior to performing the Sa’i of Hajj. To have entered into Ihram prior to performing the Sa’i after Umrah. To perform Sa’i at its correct time. To begin Sa’i at Safa and finish at Marwa. To perform Sa’i after having done Tawaf. To perform Sa’i on foot, unless you have a valid excuse. To stay in Ihram until the Sa’i of Umrah has been completed. To cover the complete distance between Safa and Marwa. To perform Istilam prior to going to Safa for Sa’i. To perform Sa’i soon after Tawaf. To be free from major impurity. To keep the Awrah covered. To face the Kaaba at Safa and Marwa. To perform Sa’i in a continuous manner, without breaks or intervals between laps. To quicken your pace between Milayn al-Akhdharayn (the two green mileposts) if you’re a man. To make an intention for Sa’i. To make prolonged Dua three times at Safa and Marwa. To perform two Rakats Nafl after completing Sa’i. 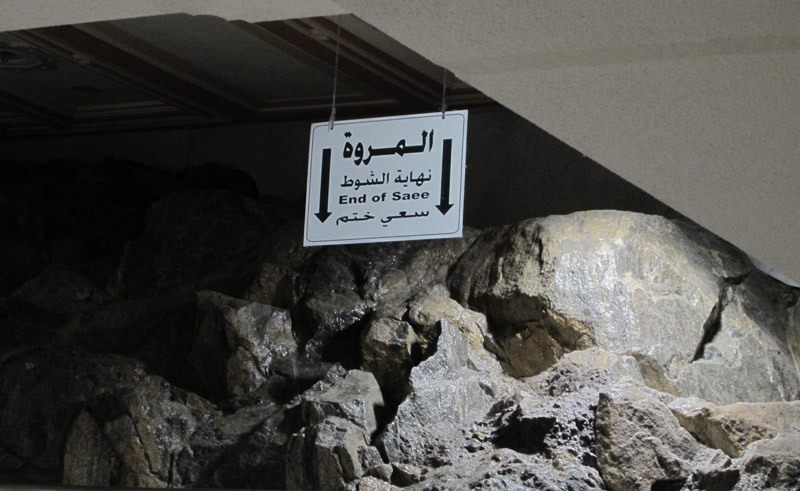 To ascend Safa and Marwa. To engage in activities such as idle talk or buying and selling goods, which would break concentration or stop the continuous flow of Sa’i. To keep the Awrah uncovered. 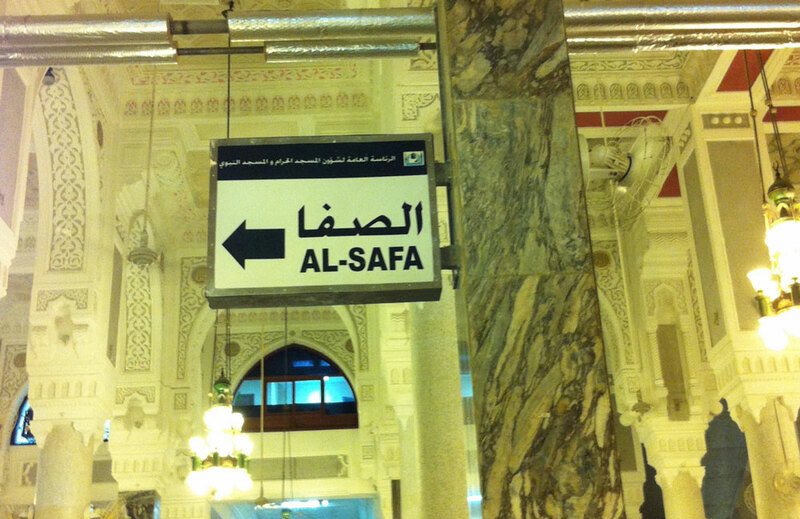 To run the entire distance between Safa and Marwa.